Having only recently purchased this album, I was pleasantly surprised to find it was actually a really good pop album in comparison to say One Direction or Selena Gomez. Although it isn’t of her typical country genre, I really like the laid back feel to “This Love’ and the electronic sound of “Welcome To New York’. The combination of genres just proves that Taylor Swift is a versatile artist, is honing a more sophisticated style and adapting to the ever changing music industry. 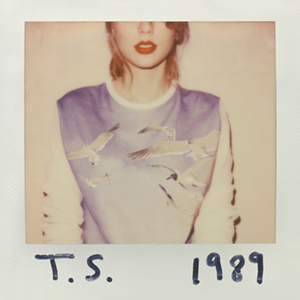 This is the fifth studio album released by Swift and debuted at number 1 on the US Billboard Chart. Her previous two albums before ‘1989’ were starting to drift more towards the pop genre with ‘Red’ listing pop bangers ‘We Are Never Ever Getting Back Together’ and ’22’. Before that was the release of ‘Speak Now’ which although was more country centred, featured some tracks which sound significantly more pop like. You can see how much Swift has come on in the lyrics of her songs which were very ‘boycentric’ in previous tracks such as ‘Our Song’ which is very idealistic and talks about whispered late night phone calls and bunches of flowers on your doorstep. Whereas, tracks from her latest release focus more on building relationships and staying true to yourself like ‘Style’ which has lyrics such as ‘I should just tell you to leave cause I know exactly where it leads’. The scenarios are so much more relatable than teenage dreams of romance. It helps that each track is insanely catchy too. The first track to be released from the album was pop favourite ‘Shake It Off’ which immediately threw me off of buying the album since it was so over commercialised and produced especially paired with the stupidly cheesy video which featured at least 5 dress changes and a lot of twerking! However, on a second listen paying more attention to the lyrics I was able to recognise how clever Taylor Swift had been here and she was merely putting a finger up to all the haters. The song completely takes the mickey of her whole life as if she was the paparazzi. Lyrics such as ‘Got nothing in my brain’ and ‘I go on too many dates but I can’t make them stay’ are just things that we are all thinking but are too afraid to say. By acknowledging her flaws, Taylor Swift has paved the way for other artists such as Meghan Trainor who achieved global success with her bubblegum pop tune ‘All About That Bass’ which was all about embracing being bigger than other girls. Swift though has got it nailed with ‘Shake It Off’ which is so postmodern and danceable that it’s hard not to love it, even if it is a guilty pleasure. The whole album is stunning and will be on repeat for the next few weeks I’m sure! Some of my personal favourites are ‘Style’ and ‘How You Get The Girl’ which is typically Swift and is labelled as an instruction manual for guys to get the girl. Lyrics such as ‘ I want you for worse or for better, I would wait for ever and ever. Broke your heart, I’ll put it back together’ are reminders of why we love this girl. She knows exactly what we want and puts it all into a song. Well worth a listen for the most upbeat love songs you will ever hear. Previous Post Chat Up Lines: A Yes Or A No? Next Post Should You Follow Your Head Or Your Heart? Aw thank you! I didn’t know that, and okay thanks I’ll have a look 🙂 Do you write a blog?